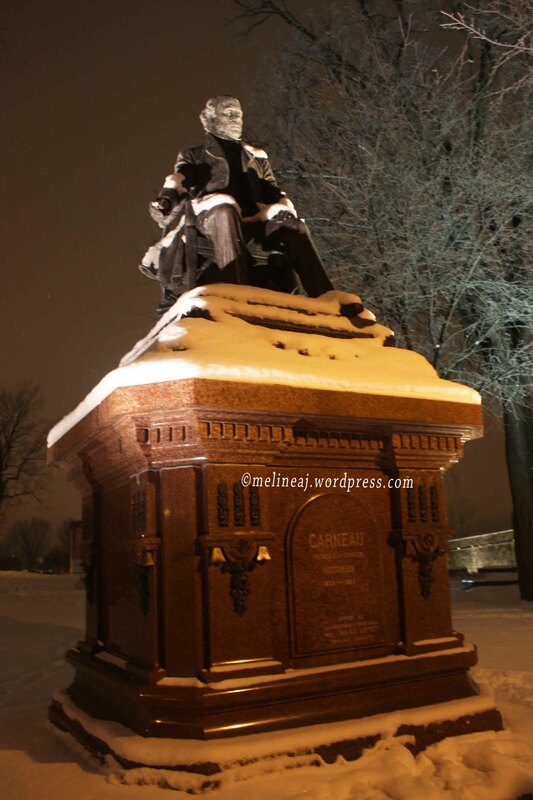 Ok. It’s a long overdue post about my trip to Quebec City & Montrel in December. So here it is and I’ll post it day by day. First day is just about our trip to Quebec City and this might bore you. Anyhow, there’ll be some tips here and there, so enjoy! Me, my fiance, and my brother started our day by waking up very early in the morning. I guess it was 5 am and yeah, it was still dark and cold outside -_- Why did we need to wake up super early? Because… we had to arrive to the airport by at least 8am. PLUS, it was the day before Christmas and we were expecting that lots of people would travel that day along with us. Battling the rain while carrying 1 big luggage in the bus was very challenging. Luckily, when we arrived at the airport, it was still pretty empty so we proceed to our gate by 9 am! Better early than late, right?! The flight from Toronto to Quebec City was only an hour. 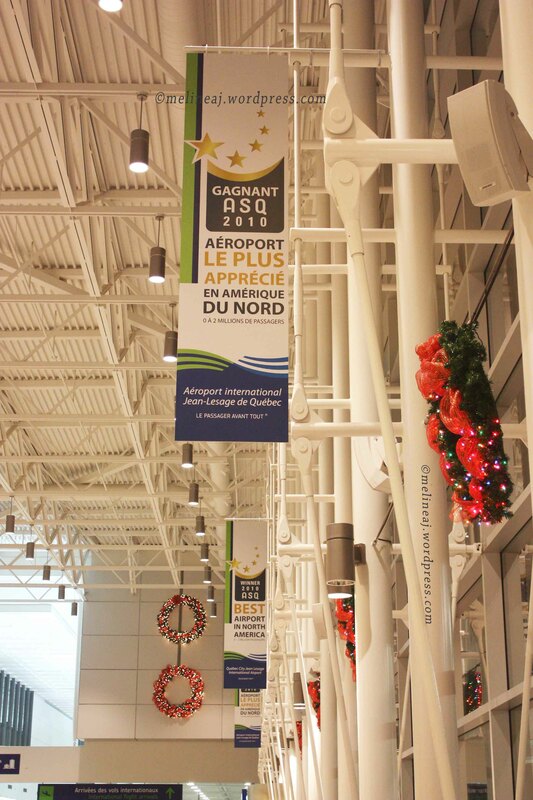 Nevertheless, I fell asleep ahahahaha… Quebec City Jean Lesage Airport is a small airport compared to Toronto’s or Vancouver’s. But then, when I looked outside I was so excited because big chunk snow welcomed us warmly! It was about 9 pm and the only way to get to our hotel in downtown was by taxi. It was supposedly flat rate $34.25 but since it was Christmas eve, we gave a bit more to the driver. 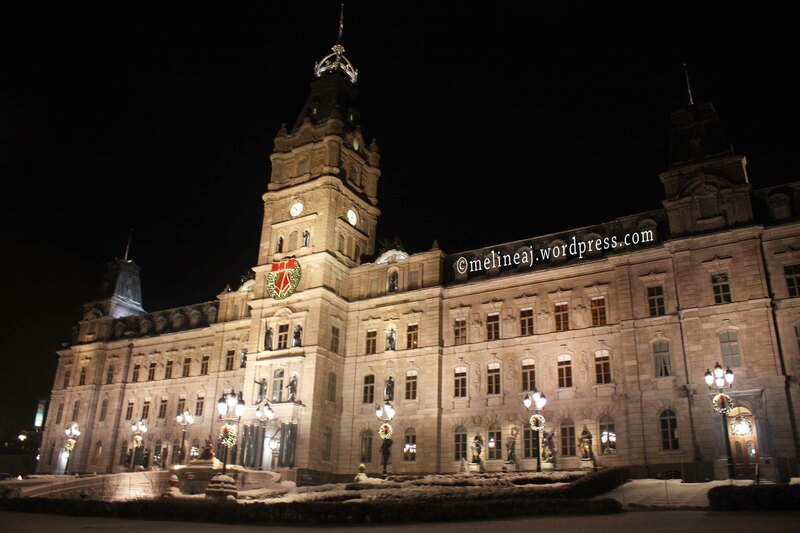 We stayed at Hilton Quebec City. Our room was facing the Parliament building overlooking the Old Quebec and it was SUPER PRETTY! 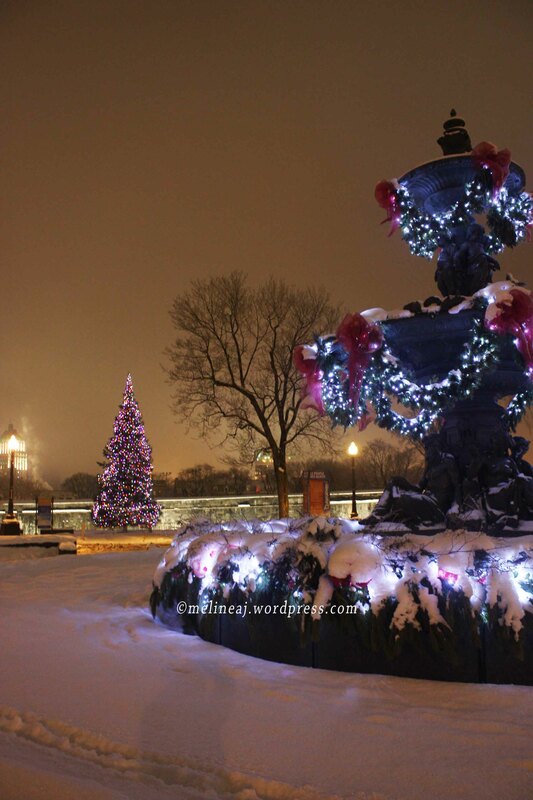 Snow everywhere and twinkling lights from the Old Quebec energized me at the late hour. Unfortunately, everything was already closed. Even the hotel restaurant only had a wrap for us for dinner. Our room was spacious and clean (PLUS the view was breath taking! ); however, the only way to get Wi-Fi connection was by asking for the password at the reception and stayed in the hotel lobby. The password was valid for an hour but the reception there was nice enough to give you more if you need. There were also comfy couches and we saw lots of people were there with their laptops. Finally arrived in Quebec City! 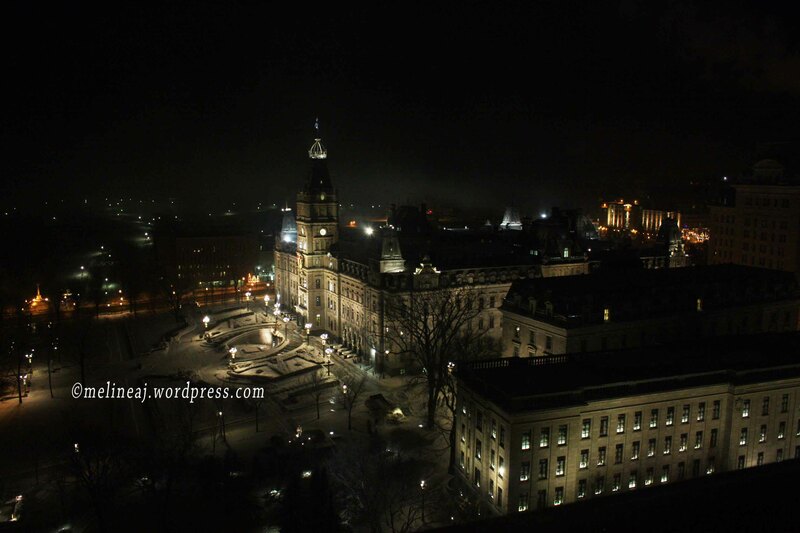 So, for the night adventure, we crossed the street and took a bunch of pictures in front of Parliament Building (Hotel du Parlement). They actually have a guided tour inside the building if you are interested. For my brother who saw snow for the first time, it was very exciting. We all wore full winter gear head to toes: toque, inner jacket, outer jacket, thermal gloves, and boots… And still, it was very cold brrrrrrr….! There’s supposed to be a fountain in front of the Parliament Building but the water was frozen but it was still pretty since it was decorated with small lights. When we were there, QuebecAdabra was going on. 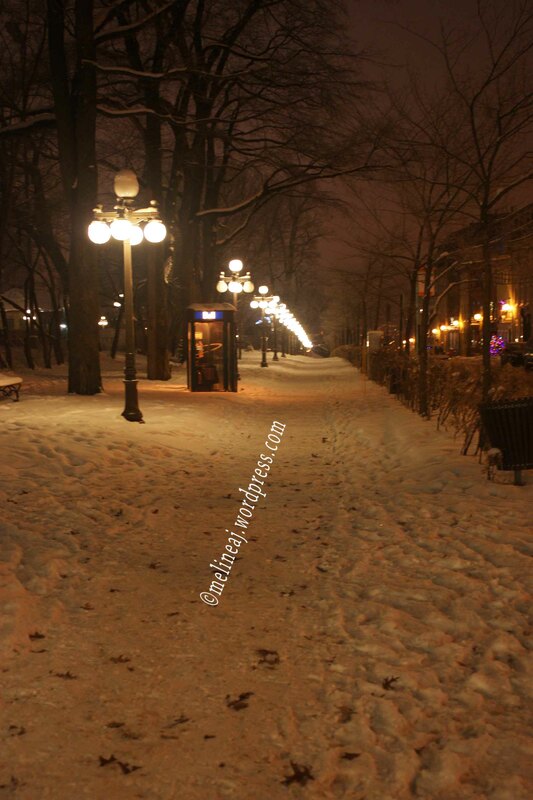 There were several different spots around Quebec City area where you can experience Quebecois winter, such as outdoor skating ring, German Christmas market, various church events, etc. There was a tall Christmas tree in front of the Parliament Building and at certain time, they had performers who spun fire balls or some group caroled Christmas songs. 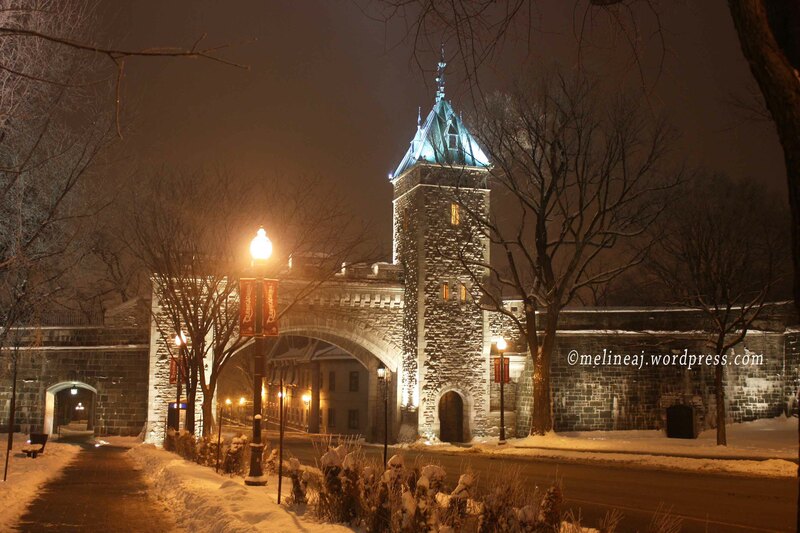 From there, we walked around the block toward Rue St. Louis passing the fort gate: Porte St. Louis. According to Wikipedia, this city wall is UNESCO World Heritage Site and is the only surviving city wall in Americas. A bit of history lesson, this wall was built by English to protect Old Quebec from French (wikipedia). 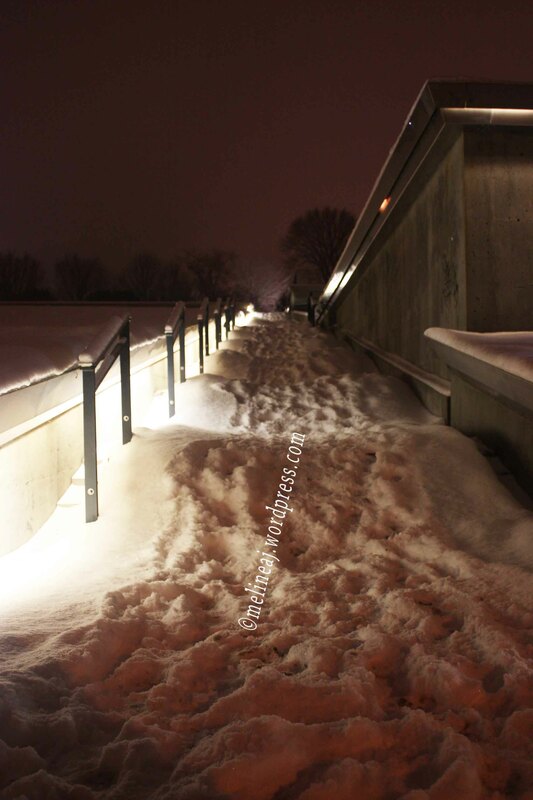 Walking toward Rue St. Louis, on your right side is La Citadelle du Quebec. They offer a guided tour if you are interested in Quebec City history and I heard that in the summer they have guard changing procession that is quite exciting since the guards wear the same uniform as the ones in England (yes, bright red jacket & high hat that looks like afro hair!). We didn’t have a chance to explore the museum during our stay (because the boys weren’t that interested hahaha…). On the intersection of Rue St. Louis and Rue d’Auteuil, there is Parc de l’Esplanade. The lawn was covered with thick snow. You can also find horse carriage station if you want to ride it around the city. I was amazed by the horses who brave the snowy weather on the station. Since I was shivering from the cold weather, we went back to the hotel and slept through the night. 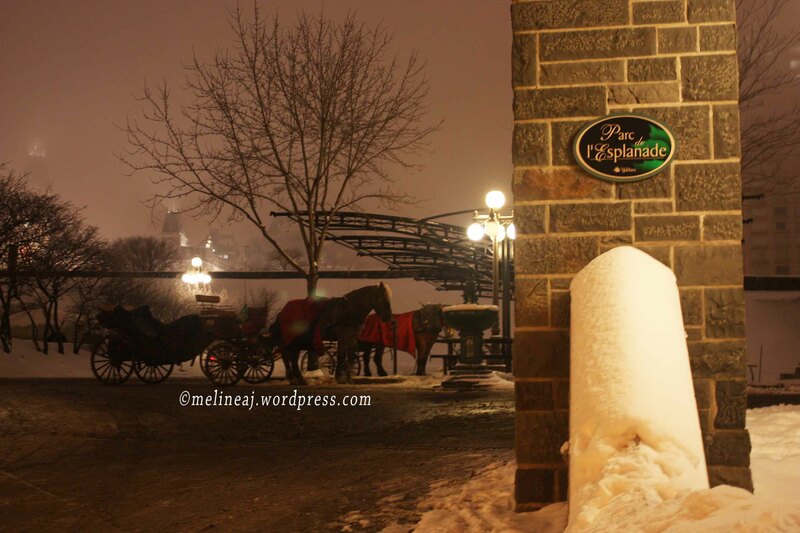 Parc de l’Esplanade – poor horses 😦 & Rue St. Louis – love the architecture! As I mentioned before, I found some useful tool to explore Quebec City that can be downloaded to your smartphone (iPhone & iPad) for FREE! Viva Cite app (http://itunes.apple.com/ca/app/les-rues-de-quebec-mobile/id347052818?mt=8) was one tool that I used ALL the time for the next few days during our trip. It’s a self-guided tour that shows you attraction places and plus it gives you a BUZZ when you’re near one of the attraction! (- if your iPhone has build-in GPS in it) SUPER NEAT! They also have a website if you want to do you research in advance.